A former regional journalist’s novel is set to be translated into several different languages thanks to a new international deal. 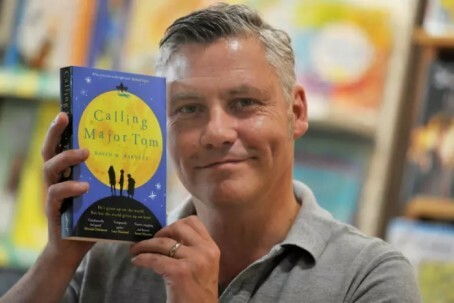 David M. Barnett’s latest book, a comedy/drama named Calling Major Tom, s going global after publisher Orion’s new commercial fiction imprint Trapeze secured publication rights for foreign language editions. As a result, it will be published in Germany, Spain, France, Bulgaria, Italy, China and Taiwan. The book by the former Wigan Post journalist features a troubled family from the town who find help from an unexpected source – the world’s grumpiest astronaut. A description of the book reads: “Thomas Major, who – through a series of hilarious mistakes – finds himself in space as the first human to head towards Mars. A misdialled phone number puts him in touch with the Ormerod family in Wigan, who are facing a mountain of problems. David, who is also a freelance journalist, has already had seven novels published, including the Gideon Smith series of Victorian fantasy adventures. There’s a better story here, I think, than what this touches on. Barnett did indeed work at Wigan but many years ago, and latterly was at the Bradford Telegraph and Argus for many years. He was made redundant in 2015 and went freelance and, presumably, turned his attention to writing this novel, so it’s good to see success after the scrapheap where so many local journalism veterans find themselves. I read last week that he’s also writing a comic for an American company.